The art of featherwork was a distinctive art in ancient Polynesia, particularly in ancient Hawai’i. There in ancient Hawai’i were found the numerous uses of feathers from uses in sacred images to ornamental uses signifying royal lineage. Feathers were used in important godly (akua) images. Feathered god images were either raised and carried throughout a battle or buried along chiefly bones. Helmets (mahi’ole) and capes (‘ahu’ula) Feather standards (kahili) announced the arrival and presence of the chiefs, and the use of a feather ornament on someone’s head (lei po’o) or around someone’s neck (lei aʻi) signified the importance, prestige, or royal rank of the wearer. Therefore, feathers were truly prized possessions in ancient Hawai’i. 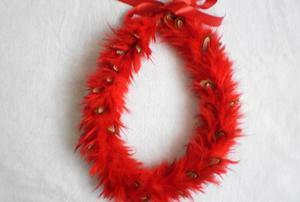 made of feathers were only worn by chiefs during battles or during sacred chiefly events. Today, you’ll still find the use of feathers here in Hawai’i. Feather standards (kahili) are used in different Hawai’i schools’ May Day Hawaiian performances. 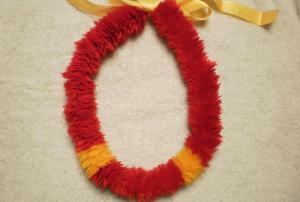 Feather leis made on a base (humupapa) are used to decorate western type hats, and ornamental leis worn around the head (lei po’o)(lei a’i) are worn on Hawaiian gatherings, functions, or events. These leis become valuable family heirlooms. 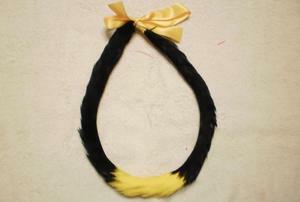 Even though feather leis are still prized possessions today, a well made one is not easily available worldwide. Click on each image to see a close up of each type of lei.